The Large Hadron Collider Pop-Up Book « Adafruit Industries – Makers, hackers, artists, designers and engineers! 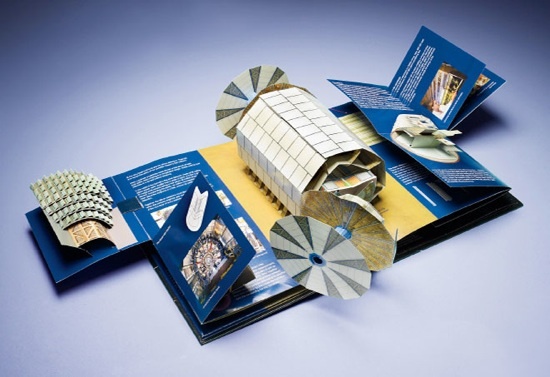 Wow, LHC pop up book! Pop-up books have always been the exhibitionists of the literary world—all those creases and protrusions. In Voyage to the Heart of Matter, Emma Sanders applies the in-your-face form to science: the Large Hadron Collider. It took CERN 12 years to build the subatomic smasher, and it took Sanders two years to re-create the folded-paper mini-me. She enlisted pop-up genius Anton Radevsky to painstakingly transform the LHC’s many elements into pulp sculpture, but they needed a lot of technical assistance—nearly 40 physicists provided scientific guidance, photos, and sketches of various parts of the $9 billion science experiment.